When the DC and Marvel Universes merged in Marvel vs DC, a new one was created: the Amalgam Universe. 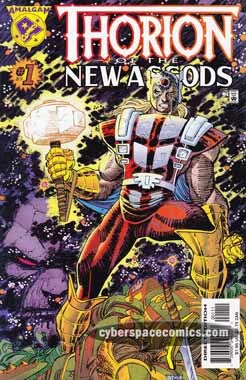 This one-shot combined Thor with Orion (of the New Gods). In a bid to unleash Ragnarok upon the Asgods, Thanoseid sends L’ok D’saad to set free the architects of the “end day”: Surtur, Kalibak, Ymir and Mangog. But, Thorion manages to defeat the villain and, by fusing the four giants together with himself, he becomes the Celestial! It’s a pretty basic plot but there’s some fun action to be had here: trolls and other creatures invading Asgod; Thorion vs L’ok armed with the Mother Cube. But, perhaps what is most intriguing is this mysterious new creature formed from Thorion and the world-ending giants. What powers and goals does this enormous Celestial possess? That’s a mystery that may forever remain unlocked – but I shouldn’t wouldn’t mind seeing it explored!